Spending time on the Gotthard pass this year has been a joy. I ultimately made two trips as the weather poor for almost the duration of the former. 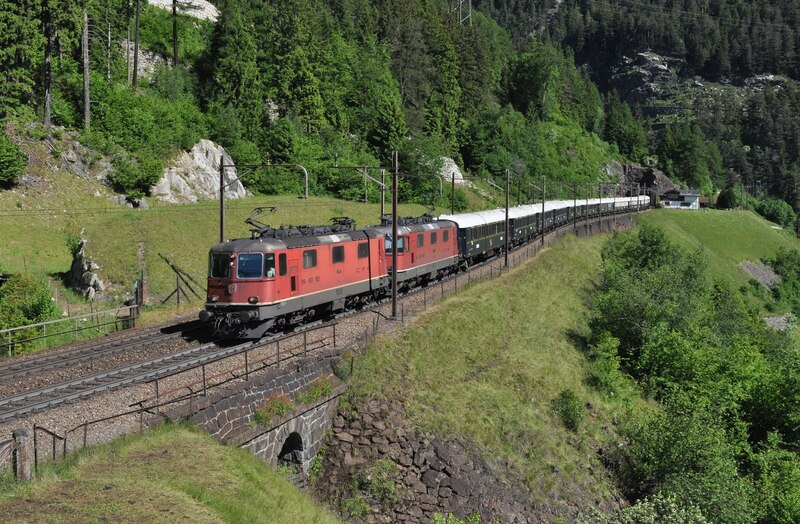 On the second trip, standing with enthusiasts of several nationalities at Wassen high level we were rewarded with the passing of the VSOE luxury train early on the morning of 10th June behind Re4/4's 11244 and 11157. Another New Year is upon us and it is time therefore to look back on 2016. I managed to visit eight different countries this year, which is quite impressive, however new countries are getting harder to come by. While none of these countries were totally new to me several had not been explored in much depth or for some time. Finally I got myself out to the Gotthard Pass in Switzerland, a location which has long been on the list. It was just in time with the Gotthard Base Tunnel opening in the summer and as of December having consumed the vast majority of trains which used to travel over the beautiful trans-alpine line. 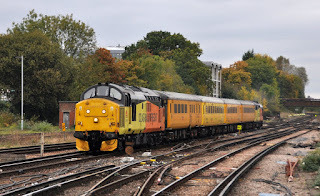 Guildford on 27th October with 37116 on the rear. Another highlight has to have been my two week long trip across America. I always love taking long distance journeys by train and the journey coast to coast with Amtrak was brilliant and I hope you've enjoyed reading about it. There are a few more location reports to come from this trip including from the famous Tehechapi pass. Closer to home the year started off with with poor weather which brought disruption to several routes in the UK- one of these resulted in the West Coast Mainline being closed into Scotland necessitating diversions to trains. Some of the most interesting of these were for Caledonian Sleeper services which took alternative routes, in some cases giving the opportunity to travel behind pairs of class 47's. There has been other good news for followers of main line heritage traction in the UK with both Colas rail and DRS returning some long absent class 37's to the network for both infrastructure monitoring and passenger operations. predict. 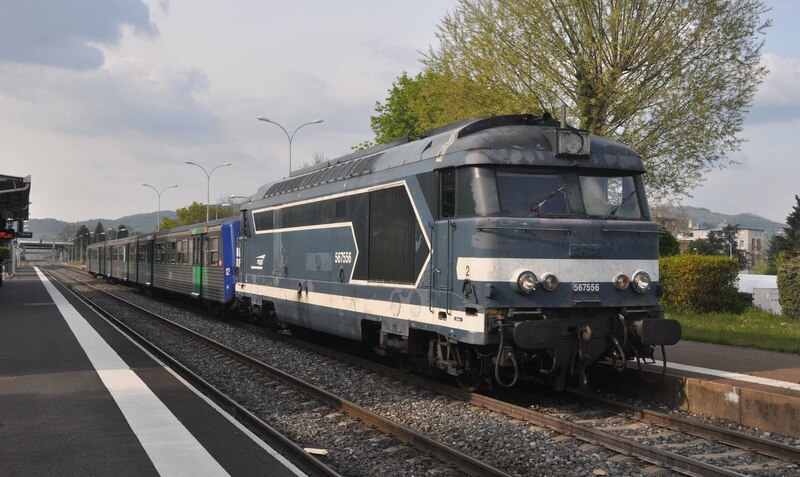 BB67556 stands at Issoire on May 2nd 2016. Unfortunately if there is one thing that the railways of the UK will be remembered for in 2016 it is the ongoing industrial dispute between Southern and the rail unions. For the sake of passengers I hope this can be resolved soon and will not be a continuing theme into 2017, though getting the right decision is of course of paramount importance. Looking ahead to 2017 it is great to see that the presence of loco-hauled trains in the UK is looking as strong as it has done in recent years with class 37's looking secure in the medium term both in Cumbria and Anglia and the new build class 68's continuing to pick up work. Across Europe we must hope OBB can turn around the fortunes of the beleaguered City Night Line services which were withdrawn by DB in December. The operator clearly sees a future for these trains and recognises the valuable contribution they make to public transport. Undoubtedly as the year progresses we will continue to see more new locomotives and multiple units arriving across the continent. 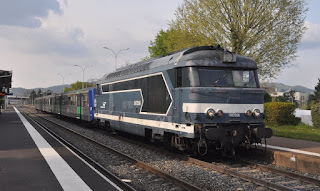 Hopefully enough interest will remain to sustain a few more enjoyable trips to France, though many of the trains which I enjoyed here only a couple of years ago are now very much on their way out. I'm not sure yet where 2017 will take me, but I'm sure there will be some interesting trips on the horizon which I look forward to sharing with you. I wish my readers a Happy New Year and hope you will continue to find these pages of interest. My stats tell me that readership is up this year but I'd love to know that it isn't just robots reading the pages so do please feel free to leave me some comments or follow this blog to be the first to know about any updates.